A stunning display of fire and water as the volcano outside the Mirage Hotel and Casino ends a show in Las Vegas, Nevada. Surrounded by fire and heaving a final spray of water into the air, the volcano situated outside the Mirage Hotel and Casino along the Las Vegas strip quietens down at least for the next hour. The volcano is set to erupt every hour in a display that attracts a waiting crowd along the sidewalk. As the volcano bursts into life it sends bolts of fire and water into the sky. 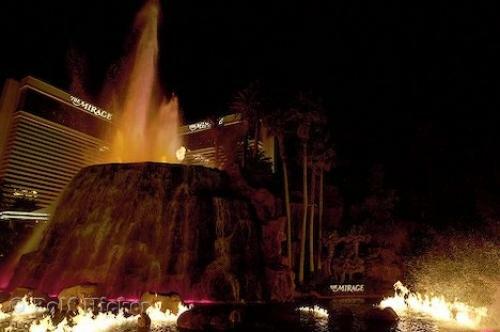 The Mirage Hotel and Casino volcano is situated along the Vegas Strip, Las Vegas, Nevada, USA. Photo of the Mirage Hotel and Casino volcano visable from the Las Vegas Strip in Nevada, USA.